By montec, March 22 in General Discussion - Any topic is welcome here!!! I have an opportunity to go spring goose hunting. However I just have my S12. Anyone have any recomondations on 2 3/4 and 3 inch shells. There is no capacity limits so I am hopefull to try and run a drum so I hope i can find matching specs on ammo in both sizes. This will be my first time hunting something that flys. I believe there is a Federal Statute that you gun can only have a capacity of three cartridges total in your gun, while hunting migratory game fowl. Tube fed guns must be "plugged." Fines are heavy, I think $10,000, if you are caught violating. I'd be very sure before I brought any mags that hold over two. I had to cut a couple down to be legal. You also have to have a Federal Duck Stamp which is purchased at the Post Office for a hundred bucks or so. Most expensive damned critter meat there is, ya'know. As far as if the gun will work or not, choke it down and it's good out to 55 yards with the right heavy shot. There are also shot size restrictions of what you don't want yo be caught with. Really, look up the laws before you go. It would have to be steel or other non-toxic. I doubt there are many particularly good options off the shelf, but you could probably use a BPS steel shot cup, straight on top of a BPGS12 and some blue dot or longshot. It wouldn't have the leg section normally found in a wad, but steel shot wouldn't need the cushion anyway. I'd love to load my own for this and get some use out of my bench, however I'm going to buy off the shelf to start. Any recomondations on what shot to use and possible fps? I am not one to shy away from 1500+ in both 3 and 2-3/4". I shoot the hornady sst slugs that state 2000fps, those are a blast. I don't personally waterfowl hunt yet, so I would just be looking up data for you rather than talking from personal experience. I can say though that you are basically looking at large payloads at medium velocities, and tight chokes. If you switch to denser stuff like bismuth, or hevi-shot, etc. Then you don't need the same velocity as steel to maintain energy down range, so overall you can get a little more effect vs pain and per capacity of the hull/ shotgun pressure limits. However that stuff is a lot more expensive than steel. Most of my friends who actually goose and duck hunt are just using BB steel shot from whatever brand in 3" or 3.5" shells and whatever tight choke the guy at the store conned them into. Higher velocity is nice for reducing the amount you have to lead, but without practicing those leads, and without patterning your gun/choke at the ranges you expect to hunt, all that performance is a complete waste. I think this is why people who hunt a lot gravitate toward buying a case of whatever the cheapest steel is in their category. Practice time trumps everything. Were I you, I would not go with the drum, but rather stick mags with 3" shells, and practice at your local clay place for a bit with your actual loads & choke. Get good at doing fast mag swaps with dummy shells at home. Get a dump pouch for your mags. If you are looking at getting into shotgun reloading, I would be happy to help you choose your setup, etc. Precision reloading is usually the best place to get components, followed by BPI. You probably should start with a press that has a collet sizer and an adjustible charge bar. Or at least one that can take an adjustible charge bar aftermarket. Those cost about $45, which is about what you pay to get bushings for 3-4 different loads so, just skip the bushings, IMO. Also, it is worth noting, that if you follow trends, the 3" shell seems to be optimum. Just like how we can tell that militarys went big and then reduced down to caliber that was just right for the job, hunters have basically done the same. 10 ga was killed by 12 ga 3.5". 3.5" is mostly extinct too though, 3.5" guns don't sell as well as they were. Almost all the 3.5" shells I see in stores are actually loaded to 3" specs. So what that means is in practice, if you are shooting the biggest payload that you can get a good pattern with out of your S12 at the highest velocity, you have a pretty good gun without a lot of real compromise, and lower recoil than the majority of people running that kind of load out of a pump gun. Guys who are really serious at shooting geese and turkey at longer ranges are the only ones who are really using full house 3.5" shells. Think of it is as the shotgun equivalent to 10mm. Maybe there will be a come back. I lwould go with 3" BBs or BBBs for geese...I like the black cloud flavor...steel is around 25 to 30 a box depending on brand. Biggest issue you gonna have is choke/barrel length...I run a 28" barrel and extra full choke on my duck gun..let them get close with the s12. Good Luck! For duck and goose, I ran with the old Federal 2 3/4" magnum steel loads in #2 for ducks, and BB for geese. (round is no longer made) Ran a Ithaca Model 51 Featherlight with full choked 26" barrel. Had quite a number of doubles (2 birds, 1 shot) with that gun. 100 bucks for a duck stamp? And then they wonder why poaching's a problem! Thank you guys the input is greatly appreciated. I bought both 2-3/4 and 3" #2 federal steel. I plan on going out tomorrow and getting my gas system working properly after conversion. I have had very little range time the last few years so I need to practice a little bit. I've done some trap in the past done relatively well for stock barrel only difference now is I have a Flash suppressor of the end. 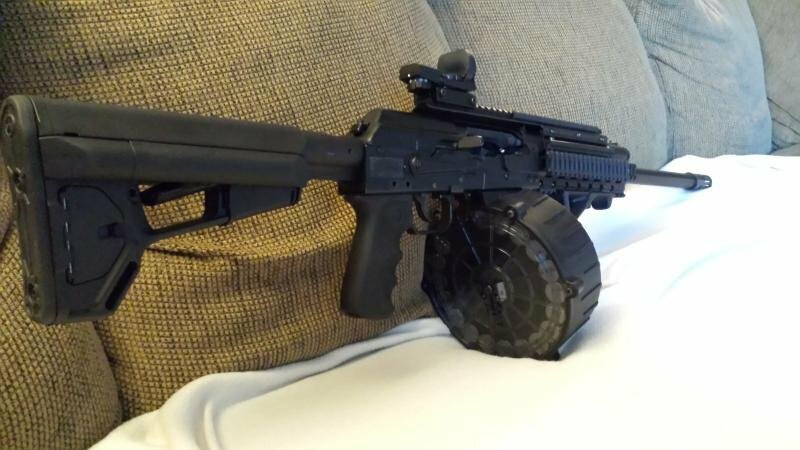 Just a curiosity sido does anybody know of the new tac 47 auto plug does 3" shells now? I do have 2 of the older versions, brand new never used. Well the gun ran great with the original gas adjuster in. Target loads ran well in the mags, but issues with the drum. 2 3/4 steel ran great in drum though. All in all functioned as it should being dirty. A lot of the 3" stuff will work with the auto plug if you turn it upside down. I modified mine to have extra detent locations, and a notch similar to the factory plug magnum setting. That covers the full range of shells. I have noticed that the remington magnums are a bit weaker than Winchester. So it's basically in the off setting for winchester 3", on the #1 ish setting for Remington 3" and in the auto setting for everything else. Oh, and probably a stray 3" shell or two on auto wouldn't hurt it, but I don't do that on purpose other than the few I did for testing. My autoplugs are fairly early made. I don't know what changes had been made, and was unaware of the new style prior to this post. I do think it is an excellent product. Just know that it doesn't give you gas you lack, it vents excess. Website seems to have the old instructions, which still say 3" is not recommended. Also has the same sketchy claim that it will help with undergassed guns, followed by a disclaimer saying of course it won't. description on the product page lacks the disclaimer, but has the claim about helping with undergassed. It's a good product, but that is not the most above board marketing I have seen.